Editas Medicine said today it has won FDA approval of its IND application for its Leber Congenital Amaurosis type 10 (LCA10) candidate EDIT-101, enabling future clinical trials for what could emerge as the first in vivo CRISPR genome editing treatment. As a result of the IND approval, Editas will receive a $25 million milestone payment from Allergan—which agreed in August to develop and commercialize EDIT-101 under an up-to-$40 million agreement. The companies expect to enroll 10 to 20 patients with the IVS26 mutation in a Phase I/II open-label, dose escalation study to evaluate the safety, tolerability, and efficacy of EDIT-101, Editas said. Editas filed for the IND in October. Earlier this month, Editas disclosed that the NIH determined that a Recombinant DNA Advisory Committee review of the protocol for the Phase I/II trial of EDIT-101 was not necessary. That protocol has been registered with the NIH. “The FDA’s acceptance of our IND for EDIT-101 is a significant moment in the field of genome editing, and importantly, a critical milestone for patients, as we are now one step closer to a treatment for LCA10,” Katrine Bosley, Editas’ president and CEO, said in a statement. Editas is still recruiting patients for a clinical natural history study of LCA10 initiated in September 2017 (NCT03396042). The study, expected to enroll 40 patients, is designed to provide data to assist in the design of future clinical treatment trials of EDIT-101 involving patients with CEP290-related retinal degeneration caused by the common intron 26 mutation. LCA10 is caused by a mutation in the CEP290 gene. 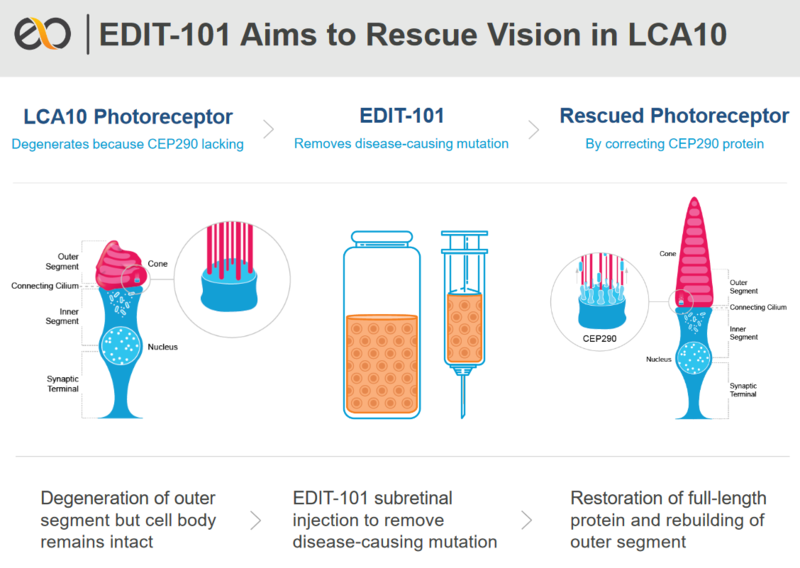 EDIT-101 is designed to eliminate that mutation by using CRISPR to cut out that nucleotide and surrounding DNA, thus restoring normal protein expression and function of remaining photoreceptor cells. Editas reasons that therapeutic approaches aimed at restoring function of remaining photoreceptor cells could arrest further loss of vision for patients with LCA10, the most common cause of inherited childhood blindness, for which no treatment options now exist. In March 2017, Editas and Allergan inked an R&D partnership that gave Allergan exclusive access and a licensing option to up to five of Editas’s early-stage CRISPR genome-editing programs targeting eye diseases, including EDIT-101. Allergan paid Editas $90 million upfront, and agreed to oversee development and commercialization of optioned products, subject to Editas’ option to co-develop and share equally in the profits and losses of two optioned products in the U.S.—one of which is EDIT-101. Editas is eligible for payments tied to achieving development and commercial milestones, as well as sales royalties on a per-program basis. The agreement—whose initial seven-year term ends March 14, 2024—covers a range of first-in-class ocular programs targeting serious, vision-threatening diseases based on Editas’ CRISPR genome editing platform, including CRISPR/Cas9 and CRISPR/Cpf1 (also known as Cas12a). Editas was founded in 2013 with $43 million in Series A venture financing by five pioneers in genome editing technology, including Jennifer Doudna, Ph.D., of the University of California, Berkeley, and Feng Zhang, Ph.D., of the Broad Institute of MIT and Harvard. “This moment is a truly exciting one for us, and we look forward to embarking on our next chapter as a clinical stage company, harnessing the power of CRISPR technology to transform the lives of people with serious diseases around the world,” Bosley added.